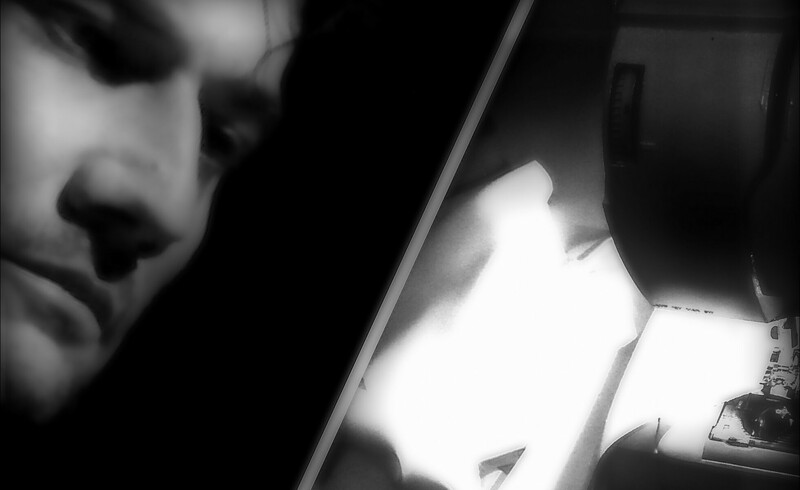 The night before last, I returned to Oregon a sleepier, more jet-lagged, but completely blissful, girl. The long-planned “Don Carlos Adventure” consisted of one night in London–including a visit to the Royal Opera House–followed by four nights in Paris. The Paris days/nights included four operas: Così fan tutte, The Merry Widow (with opera Hero and my first “Rodrigo,” Thomas Hampson), and two performances of the French version of Verdi’s Don Carlos, with the cast of a lifetime, on the 19th and 22nd. I will write a separate post about Don Carlos as a production. Here, I will just share a few photo highlights of the trip that speak louder than words of the joy we experienced together. The “Three Little Maids” (which had originated as a joke, as the three of us get so Gilbert-and-Sullivan goofy about our opera Heroes, and “everything is a source of fun”!) include myself (“Rodrigo”), Viv Hannides (“Carlo”), and Maura Devine, our dear friend from Ireland who joined us in London. In Paris, Maura, Viv, and I shared a beautiful fifth floor apartment on the Boulevard Beaumarchais, about a 5-7 minute walk from the Opera Bastille. “The Operaettes”! From left: Maura, Ursula, Ilse, Rach (me), Viv. During the trip, we met up with other amazing opera fanatics…Ursula from Ireland, Ilse from Vienna, Rosemary from Australia, Christine and Paul from France, and another dear Christine from England, dear Pam from England… What a joy. Day 1, Oct 17th: London. Viv came to meet me at the airport at 7am, with a “Mio Rodrigo” sign waiting! (I nearly had brought one in my carry-on, saying “Looking for Mio Carlo!”) We drove around that day, listening to Jonas, and talking. Later, Maura met us ~ as did, unexpectedly, our very dear friend Andrew Pycock!!! This was entirely a surprise, and I will never forget the shock of seeing him sitting by the ballerina statue near Covent Garden. The four of us shared a meal together before the three ladies went to see Les Vêpres Siciliennes at ROH with Erwin Schrott, Michael Volle, and Bryan Hymel. An excellent production! I wept at the beauty of the sound–particularly of the chorus and orchestra, and also Erwin’s massively powerful and beautiful voice–which hit us so strongly up in the amphitheater. Everyone was fantastic. One of Viv’s friends, who had a Grand Tier box, invited Viv and I to occupy the two empty seats in his box after the interval! What a treat. 🙂 The “three little maids” spent the night in two sweet rooms above a pub, before catching the Eurostar to Paris the following morning. A note: meeting Erwin Schrott after the opera was a real honor ~ which I nearly missed, as I was so shy about it that Viv had to drag me over to meet him. After which I managed to clumsily drop the program (which he had just signed) right at his feet. Day Two: Paris. The Merry Widow. Thomas Hampson, with his Parisian “Grisettes”! Day Three: Paris. Don Carlos, No. 1. Afterwards, the three leading men, Jonas, Ildar, and Ludovic, didn’t come out to the stage door exit, alas, as they went out another way to go to an after-party. (This was the night of filming Carlos, so it was a well-deserved celebration!) However, we had the honor of meeting the two leading ladies, who are even more beautiful in person, Sonya Yoncheva and Elīna Garanča!!! Day Four: Paris. Recovery Day. Day Five: Paris. Cosi Day. Palais Garnier. Day 5, Oct 21st: Paris. Così fan tutte (Palais Garnier). What an experience it was simply to be at the glorious Palais Garnier opera house. Previous to this, we’d done a self-guided tour. To then have the honor of being able to see a production here as well was pure magic. The was an abstract and modern-dress production which incorporated a lot of modern dance. Though not my ultimate Così experience in terms of production, it was beautiful nonetheless, and we thoroughly enjoyed the experience. Our own little “after party” consisted of drinks at “Les Associés,” a bistro across the street from Bastille’s stage door where we’d hung out previously to discuss the productions. I think the “Operaettes”–plus our new friend Howard–were there until at least 1:30 in the morning. This was followed, of course, by a “three little maids” session of more tea and talking by the time we arrived back to our apartment! The only down-side of today was that I realized later that I’d lost my opera glasses (a.k.a. “Jonas goggles”) in the taxi coming from Palais Garnier…hèlas! Day 6, Oct 22nd: Paris. Don Carlos #2 (Bastille). After a large brunch with 17–yes, 17!–opera and Jonas fanatics at the “Cafe des Anges” near the Bastille, we walked together to our final performance. Previous to the performance, however, Viv and Maura gave me a very beautiful gift: a new pair of “Jonas goggles”! After the performance, all of our makeup cried away, we dashed to the stage door, and were soon crushed in the adoring crowd. (Alas, the security guard kept kicking us out from our spot inside the barrier and made us get behind the security barrier like everyone else! 🙂 ) Nonetheless, in spite of the crush, it was such an honor to meet the three Opera Heroes who made us weep and sent us into ecstasies during the performance. Ildar even posted a video of the crush of the crowd at this performance. You can barely see the top of my head as the camera passes by, but there are clear shots of Viv, Maura, and Ilse!! We had one final beautiful surprise before Viv and I had to dash back to grab our luggage from our friend’s hotel room before catching the last Eurostar back to London that night. My flight was to be the next morning from Gatwick, so the poignant Act IV arias of Rodrigue–where he sings that his “supreme day has come,” and that he and Carlos must say “farewell”–had Viv and I in a tidal wave of tears. For a blog with “Don Carlo” in the title, I’ve written surprisingly little as yet on this, my favorite, opera. (Truthfully, I haven’t written as often as I’d like to in general.) Perhaps it is that trepidation that one has approaching a beloved subject…how to express thoughts in words that do it any justice? In time, I hope to explore this opera here in more depth, as I continue to learn. Today, however, it has been a year since the opera obsession started; it feels like a good time to take a pause. This blog has been about the “opera journey”–more the opera than the “journey”– from a beginner’s perspective…not because my journey has any significance, but just because it is too joyful not to share. But this post, more personal, relates to what will be a huge milestone and joy for me in the coming year…thanks in great part to “mio Carlo,” Viv. 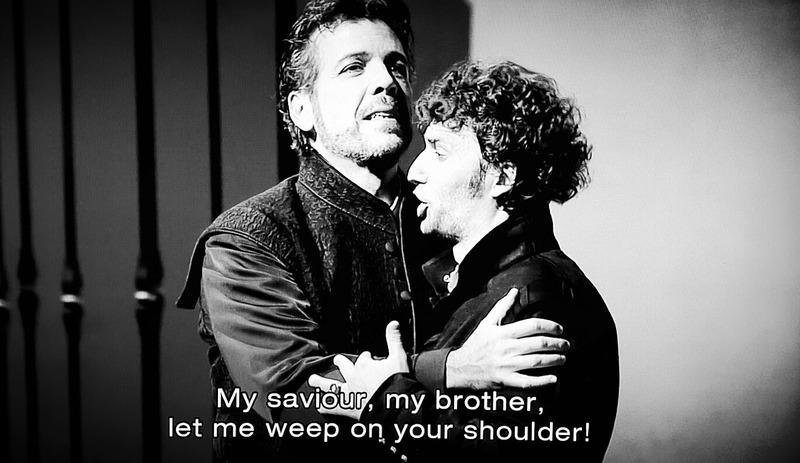 Rodrigo (Thomas Hampson) comforts his Carlo (Jonas Kaufmann). Don Carlo, Salzburg 2013. Why Carlo? (How shall I count the ways?) Phenomenal characters, complex relationships (talk about dysfunctional family! ), glorious music, chilling and captivating political and religious themes…it has it all. It’s the Hamlet of opera, in combination with some of the intrigue of the history plays. But more than that, Don Carlo has, to me, the most moving relationship in any opera: the brotherly, self-sacrificial love between Don Carlo and his friend Rodrigo, the Marquis di Posa, who is caught between his affection for Carlo and his concern for the suffering of the people of Flanders under the heavy hand of Carlo’s father, King Philip II of Spain, and the Inquisition. To stretch the Hamlet connection, the Carlo/Rodrigo friendship has a bit of a Hamlet/Horatio dynamic–albeit with a stronger, more proactive “Horatio.” One, Carlo, is “passion’s slave,” haunted by a disastrous personal crisis in the midst of political ones–the other, Rodrigo, a staunchly loyal friend who sees the potential in him. I’ve always had a soft spot for stories about male friendship. (I hesitated before seeing a version of the opera, after hearing the friendship duet on youtube–love at first listen–because I feared that Rodrigo would turn against his Carlo in the end, or that it’d end up being more rivalry than friendship.) But, not to spoil it, Verdi not only pays off the incomparably beautiful duet, a glorious tribute to friendship, but does so in a big way. I hope you will experience a version of this opera if you haven’t already…I eventually get around to writing a bit on those I’ve seen and heard. My friend Viv (below) has often tried to guess which opera-relationships would likely be a success, if not hampered by the death and villainy that goes with the opera territory. (Would Mimi and Rodolfo honestly make it “in real life”? Tosca and Mario? Calaf and Turandot? It does make one pause…) I can only say, without a doubt, that Carlo and Rodrigo would make it. 😉 That’s the difference in this opera, an opera where the love serves the ideal, and the ideal the love; where friendship is deeper than the (sometimes) shallow ebb and flow of opera romance, where love is truly stronger than death and disappointment. It’s the bond of brothers. Not unlike this friendship, the community of those who love opera is also close-knit. Opera friends are immensely enthusiastic and warm in sharing their joy, recommendations, practical help and advice…even sending/exchanging CDs or DVDs that they love or want to pass along. (One of mine just went out in the post to a friend the other day, and hers to me before that.) Listening to opera together, sharing knowledge and thought and insight. Opera buddies make life more and more beautiful all the time. My parents are hooked, and have not only tolerated but supported their daughter’s mad hobby, and will even listen to Wagner with me…a beau geste indeed. 😉 We’re all Carlos and Rodrigos to one another. Around the time of my first Don Carlo, my long-distance friend Viv Hannides (fellow Kaufmanniac and Opera Enabler Extraordinaire, who allowed me to mention her name and snag a photo of hers–on the left–for this post, without knowing why) told me that there were rumors of a production of the French-language version—Don Carlos, as it is typically called in that version—to be performed at the Opéra National de Paris (Bastille) for the 2017-18 season, with Jonas in the title role. This would be historic on several levels: the stellar cast (more on that below) and the novelty of its being the full, 5-act French version. (They will apparently be doing the 5-act Italian version the following season.) Viv, who has a Paris Opera subscription, offered to help me get tickets, even back when we had just started to connect, if I wished to try for it when the time came. A gift from Viv, October 2016. Another gift from Viv, New Years’ Eve, 2016. Most recently, she has redoubled my joy at the return of Jonas–in the Paris Lohengrin–after his months of recovery from the vocal injury. Viv was there the first night, January 18th, and stayed hours after to wait for him to come out after the show, keeping me posted as she waited. Little did I know that a large part of her intent was to have our hero sign something for his long-distance fan who has not been able to see him in person yet. I won’t try to describe the emotion here. (My poor mom, who happened to be around at the time, had to put up with constant, weepy interruptions…) Not only to see my name in Jonas’ hand, but, even more, touched that “mio Carlo” would have even thought to take the time out of those few, precious moments—really, how often are we in close proximity to Jonas Kaufmann?–to think of her Rodrigo, so far away. Photo credit: from the Espace Lyrique facebook post of Oct 2016. Of course, getting the tickets are only step one, but we’ve done it. Paris, October 2017, here we come! (Somehow! Extra shifts at work, a few extra sewing orders, a little less sleep…for Carlos? For Thomas, Jonas, Ildar, Ludovic, Elina? Absolutely. Sleep is overrated anyway! :)) Again, Viv saved the day, spending hours navigating internet delays the moment ticket sales went up for Carlos. Truly, another huge gift…I don’t know how it could have been done otherwise. And thank you so much, mio Carlo! Ci può la tua bontà. Fire of love that will set men free! May freedom call and inspire us! Accept the vow that we swear! We shall die united in love! 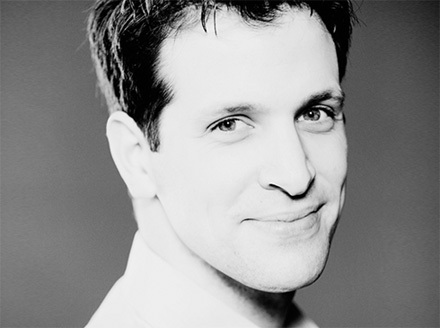 HUGE congrats to the great Luca Pisaroni, an iconic Leporello, on his recent role debut as Don Giovanni at the MET!!!!! #StefanKocan, the ultimate #Sparafucile in Verdi's #Rigoletto @metopera. What a performance on the radio tonight!! !